Moto Guzzi has been producing authentically Italian motorcycles since 1921. Nearly a hundred years of tradition and passion; almost a century of magnificent motorcycles all built in Mandello del Lario, combining the best technologies and the most invaluable Italian manufacture. The next goal for the brand is to celebrate its 2021 centenary with an ever-expanding range of motorcycles. One step into the future has already been taken with MGX-21, a non-conformist and innovative bagger that has shown how Moto Guzzi is capable of interpreting with its own personality the various influences proposed by motorcycle culture without ever betraying itself. The Concept V85 is another gaze opened towards the future, the next challenge for a brand that aims to offer enthusiasts a wider range that meets every need. The features it has place the Concept V85 between the classic V7 and V9 family and the 1400 large cruisers, covering the gap left by Stelvio. It is a motorcycle that has travel in its blood and the unmistakable spirit of Moto Guzzi. The Concept V85 comes from the best tradition of Moto Guzzi, built out of authenticity, which is the true fundamental value of the factory in Mandello and has been created around an engine that, with its significant increase in power, guarantees ridability and fun. It is the motorcycle that was needed by an increasingly standardized market dedicated to travelling in its purest form, recalling the epic rally raids of the 1980s, a point of reference from which it inherits style, charm and thus emotion, but which has been designed to take on both everyday routes and long-distance routes, using the most up-to-date requirements. In its use as a travelling bike, the Concept V85 is a new and original offering combining stylistic ideas from the golden age of the motorcycling adventure with the contents and functionality of a modern Enduro travelling bike and is part of a natural evolution by the Lake Como-based brand and its motorcycles, which is wholly consistent with a range development policy that saw the launch of the V9 a year ago and the third generation of the V7 this year. The Concept V85 is dedicated to those who, while never ceasing to dream of Dakar, yearn for a bike that revives the spirit of adventure on their daily journeys. The Concept Moto Guzzi prefigures a modern motorcycle, fully equipped and with a strong character, but also a pure and essential motorcycle with its shapes that originate directly from Moto Guzzi’s own history. Designed with proportions that are anything but prohibitive, accessible for riders of all sizes and experience, tight in the waistband to allow freedom of movement, the Concept V85 boasts an optimal ride for rider and passenger. No compromises have been made to the detriment of comfort and usability, resulting in a comfortable bike for two, with bags installed on the chassis frame. The fuel tank design harks back to the tradition of the Moto Guzzi models set up for the African rally raids. In line with the Guzzi story, there is also the high front mudguard and the beautiful double front headlight, stylistic and functional solutions already present on the NTX 650 from 1996 and the Quota 1000 from 1989. Modern technology elements – such as the fully digital instrumentation and the front LED DRL light series on the front headlight – combine classic styling with the off-road world. 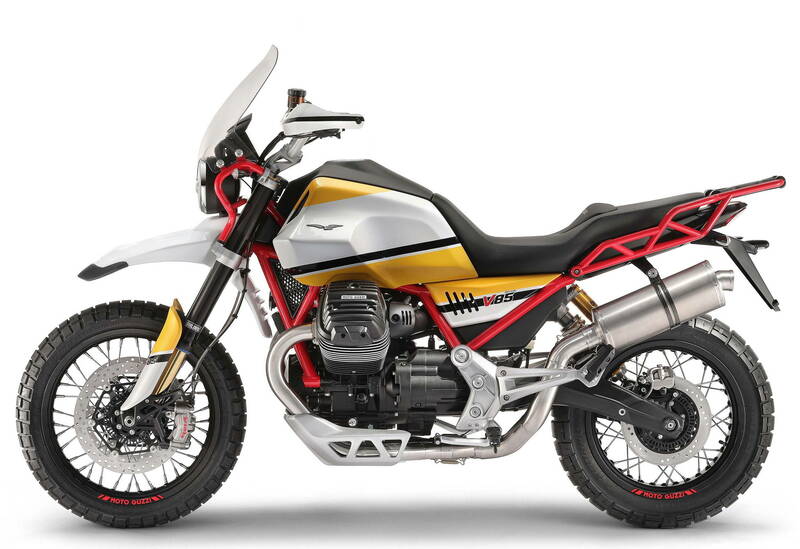 Moto Guzzi’s expertise in the construction of outstanding bicycles is also confirmed on the Concept V85. The frame is completely new; in pursuit of lightness, rationality and accessibility, it is made of steel tubes and exploits the specific anchorage of the engine to create a rigid structure that restores precision and rigor on the road as well as robustness and the right feel for off-road riding. The beautiful asymmetric aluminum swingarm has a curved shape on the left side, useful for designing a highly linear exhaust pipe pattern so as to minimize the lateral dimensions. The right arm on the swingarm houses the new shaft drive transmission. The mono shock absorber directly connects the chassis to the right arm of the swingarm, a solution that facilitates access to the hydraulic and spring preload adjustments, thus allowing free space for the exhaust system layout. The suspension systems offer a very generous wheel travel for an optimal off-road use, thanks to a substantial engine floor clearance, as well as comfort on the most commonly-used roads. A new Moto Guzzi engine is launched on the Concept V85. 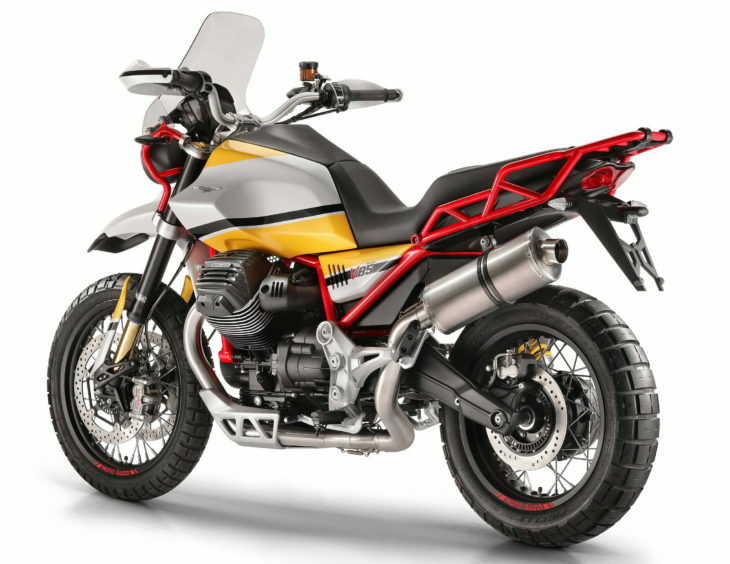 The construction design is proprietary and excludes all current Moto Guzzi production: in fact, it is a two-cylinder 90° transverse air-cooled 850cc which, thanks to its complete redesign, has 80 HP of maximum power. It is an engine that, fully in line with Moto Guzzi philosophy, announces itself as a classic for the near future, providing rewarding performance on every kind of route, as well as guaranteeing great character and the usual spectacular force at lower running speeds. The technical platform of the Concept V85, including its mechanics – as always leveraged inside the body of the vehicle, with all its beauty being deliberately left in sight – is the technical basis for the development of a series of new motorcycles. It will be a family of medium-sized cylinder bikes, from different intended uses, combined with strong character, generous performance and a style which is typically Moto Guzzi. Yeah, this will have me looking at Guzzi again…as long as parts and mechanical/aftermarket support is there. Nothing like having a beautiful bike that you can’t get parts or a mechanic for. As a card carrying Honda rider for many years, I always wished they would have carried forward the CX650 series from the early eighties, and produced an 800-900cc version. (As scarce as MG dealers are now, they were non-existent around here then). Finally, in 2008, I took the plunge and purchased a new Breva 1100. After a few anxious weeks and months, wondering if the anecdotal stories of Italian unreliability, quality control, and expensive parts/repairs would prove true, I settled in and just rode the damn thing. 9 years and almost 100000 km later, it has been stone reliable (other than a few bump starts due to a minor starter solenoid wiring issue), and has been my go-to bike for all my long trips, including Coast to Coast and back through Canada and the USA. I have performed all the servicing myself, because I like doing it, and it is simple, and parts are extremely reasonable. My problem is there is no close replacement for the Breva. I actually purchased a 2009 Stelvio, but the increased fuel consumption, small tank capacity, and substantial size just didn’t measure up to the Breva. The V7-V9 series is just a tad less powerful than I need to haul my corn-fed carcass around, and is physically a little tight, while the cruiser styling and weight of the 1300 series just doesn’t appeal to me. I am really excited about this concept, as It hopefully is the basis for other models, but as it is, my chequebook is ready to buy this bike unchanged. Including the color; I had a cartoonish red with yellow seat 1994 BMW R1100GS! (The first of the Bloated Adventure Tourers, never took it off-Road like I did my 88 R100GS) I may even sell my Africa Twin, although I love the DCT! A stunning motorbike. Triple disc brakes, electronic cruise control, a tank that looks big enough to take you further than down the street and more. Hopefully those wheels are like the ones on the Stelvio, tubeless. This bike along with the new RE 650s should prove tempting to adults the world over. You know…Adults. The people with jobs that can pay for what they want after they already have what they need. Truthfully — perhaps sadly — I bought a lot more motorcycles before I could actually afford them. We “adults” aren’t doing our part to subsidize the moto industry so well, and thus the manufacturers are looking for the recipe to get money out of the youngsters. I much prefer the Duke 690’s appearance, but I think the 20-something crowd will like the Vitpilen better. I’m surprised they didn’t stick that mill in the Roamer. This doesn’t look like a concept bike at all. The castings, plastic and fit look as if it’s already in production. The welds are gorgeous. The exhaust system is beautiful, it would be nice if that could survive into production intact. The concept is fitted with top of the line appointments, Brembo radial mount calipers and Ohlins shocks, a big cut above the V7 line, which are essentially budget bikes. It will be interesting to see what the “family” grows into. I’m all for a sporty Norge too, but a new LeMans or 850S would be sweet. “…as well as guaranteeing great character and the usual spectacular force at lower running speeds.” Translate: It pull plow real good. I really like this motorcycle and 80 HP from an 800cc twin is great! For those who don’t like the colors, please remember that this is a pre-production bike and they want people to notice it. I find the colors refreshing, as gray/black/satin-whatever has been as overdone as tattoos on millenmials. Very nice. Don’t see any provision for boxes or trunk. Rack would work for a trunk, but how do you affix those big aluminum side boxes? Most advs these days have provisions for factory sidebags. Touratech and SW Motech will come up with something. Anyway this is a prototype. The actual bike may have some sort of pannier attachment. What is that massive red frame structure under and behind the seat for, do you think? Prettiest adv bike ever built, bar none. I agree. Beautiful simple practical. Love all air-cooled motor. Make mine with 90ft-lbs of torque in a new Norge sport touring setup…. please. I mean pretty please…….. I like it, the Stelvio never really got past ugly. This however is sweet and the color looks good to me, remembering the BMW “Bubble Bee” GS makes this paint job very pretty. More stats would be great. I have a Stelvio. Harumph! I do agree with you to some extent when the bike is viewed in pictures. However, in person the Stelvio is a lovely motorcycle and everyone I’ve met comments on its beauty. My apologies for loose lips concerning the visual appearance of your ride. This is a bike that could bring me back to the Guzzi fold. It’s gorgeous. Lighter, smaller and likely a lot more useful than the Stelvio NTX I had. I’d definitely tour on it. The only thing I would change, besides the paint, is those pesky Alpina STS wheels. Those o-ring sealed spokes are too finicky. They should have partnered with Kineo, despite the excessive cost. I would take it, even in those hideous colors. Hopefully they ditch the red when it reaches production. MotoGuzzi does make beautiful motorcycles. Looks like it belongs in Canada. But I still want one. Note to other manufacturers of ADVs and Wannabe ADVS: THIS is how you do a beak. You ditch the front fender and beak and make the high fender a truly functional NON-BEAK! I really like this. Aside from the Ronald McDonald color scheme (seriously, you would guess by now that red and yellow on one vehicle is a big styling no-no! ), this looks to just be a great, middleweight all-rounder. Even at the crank, 80HP out of an air-cooled 850 twin, in this day and age, is quite impressive! Plenty of power for me, especially if the bike stays in the 500-lb. ready-to-ride range somewhere. Seating position looks quite rational, the goggle headlights are pretty nifty, and I’m digging how they wrap the frame motif up and around the headlight supports and steering head. Put that motor in a sport touring chassis please. Bigger news would be putting that engine in the V7 line. That would be impressive. Wouldn’t that make it the V8 line? By the sounds of the Engrish marketing blurbs with this bike, we may expect an entire line of bikes on this platform. So, maybe your wishes will come true in this case! Perhaps this ADV, a V7-Racer-esque cafe’ bike, a V7 Special-esque standard, maybe a Cali-style middleweight cruiser, and maybe even a Mini-Norge sport tourer? 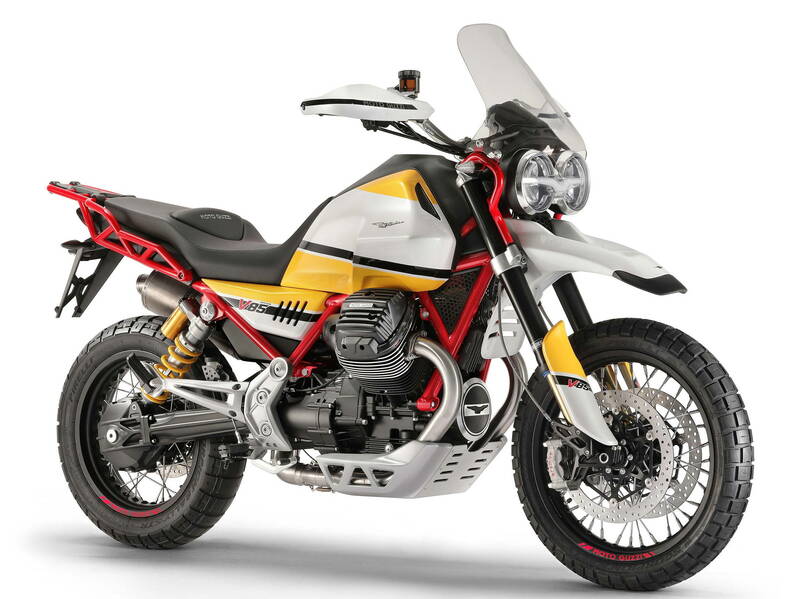 Unfortunately, that’s a LOT of product development for a company like Moto Guzzi, but with these modern modular platforms, the costs should be cut pretty drastically for that. Hell, don’t even bother to re-tune it! Give it the same solid state of tune all the way around. Why not? The frame seems to be modular (the rear rack is bolted on), so, once they have the engine and frame, to make different models only requires to change wheels and superstructures. Yes. That is all, just yes. Bike looks nice but the marketing text is absolute crap, did it lose in translation ? You wouldn’t have to wash it, dirt would improve the looks. 80hp? Finally a competitive engine for Guzzi’s otherwise very attractive motorcycles. Hopefully the mill will migrate to the V7 series as well. Now, all Guzzi needs to do is fix the chassis and brakes. It’s an all new chassis. I deduce that you have not ridden a modern Guzzi. Properly set up Guzzi/Brembo brake systems are marvelous. You would be mistaken. In fact, I’ve never ridden a Guzzi that wasn’t “modern.” I wouldn’t make such a comment without having ridden one. I have ridden two modern V7s, one of them for a couple of hundred miles. The brakes are adequate but leave much to be desired for sporty riding, the same of which can be said of most parts of the bike including the noodly chassis, frankly. It is a good thing the bike is so slow. I realize that the chassis on this V85 is new, but I was referring to the V7 line in particular. They are good bikes, but those beautiful machines deserve to be great bikes. Jeremy, you’ll like this story. Back in the late 70s (19, not 18…), my old buddy in Marin County Phil C. was often first in to Stinson Beach on the “Sunday Ride” starting at the Aarco Station at Tam Junction in Mill Valley. Phil rode a sweet Guzzi LeMans 850. On one particular day, after breakfast in Pt. Reyes, the CHP was out in force, including their helicopter. Phil raced and beat even the CHP helicopter on one little stretch. There is something endearing about Guzzi’s riding experience (owned a yellow Sport 1100i and Quota 1100i in gorgeous aquamarine blue). One does need to take a little more care torqueing fasteners for big bore twins like this. My Sport had a loose battery terminal screw, which caused intermittent current, which caused ECU failure, about $1100, thank God under warranty. I did not baby the Quota, but certainly no more abuse than my R1150GS. The R1150GS was faultless for 40k miles (was originally a BMW “fleet” bike likely used for road tests), while the Quota tossed a rod bearing for unknown reason under 20k miles. No idea what is current parts prices and availability, but a clutch lever in the early 00s was $125 and my loooong search for lower cost matching part was fail IIRC. If they bring this to the US, the super tenere is history.This looks like a hoot.I had a 2001 Quota, which was fun, but also worrisome as it never had a factory shop manual available during the time I owned it. I sold the quota after 7 months to finance dirt bikes for my daughters and me. Good decision. This is really a nicely designed bike- kind of a fun surprise among all the other new bike announcements. I like this a lot…especially the fact that it has a functional high front fender (rather than a street bike fender with a beak tacked on for show). That said, I’m pretty cynical about concept bikes ever seeing the light of day in quite the same form as presented. Nice. Sort of hearkens back to the BMW R80G/S from the early 80s. Unlike last year’s R nineT Urban G/S – a GS in clothing only – it looks like this Guzzi could actually spent some time in the dirt. Or at least fire roads and easier jeep trails/mountain passes. 80 hp for an air-cooled 850 twin isn’t horrible and a nice step up from the rather anemic V7 and V9. The lack of water cooling complexity and weight plus easy valve checks are a big plus. It will be great to see this engine spread out through the Guzzi lineup. Btw…is there anything we don’t shoot in the USA? Ooooohh, Hello Papagena. Tu bella come la papaya! I wouldn’t be comfortable riding this in November, it’s likely folks would break out the 12 gauge and try to bring it down.